*Quorum is 5% of membership or 10 members, whichever is higher. Followed by GA-CHILL (drinks etc) at a location TBD by vote!! The proposed agenda for the General Assembly is posted here. 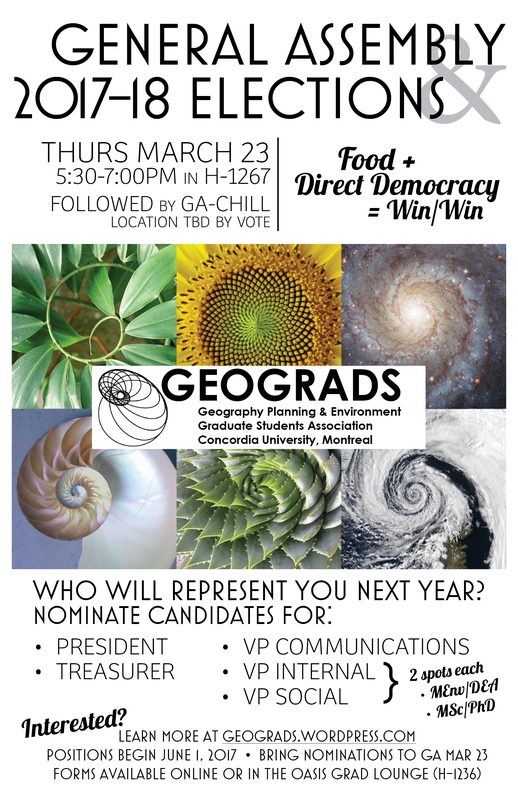 Feel free to submit items to the agenda, such as endorsements, to gpe.grads@gmail.com until March 19th. ………We can even vote on a name for our inflatable palm tree! How? The best way is to send your item to gpe.grads@gmail.com to have your point added to the agenda (please do so by March 19!). Or you can come to the GA and add it to the agenda there. In accordance with our bylaws, we announce the nomination period for Geograds Council positions 2017-2018. 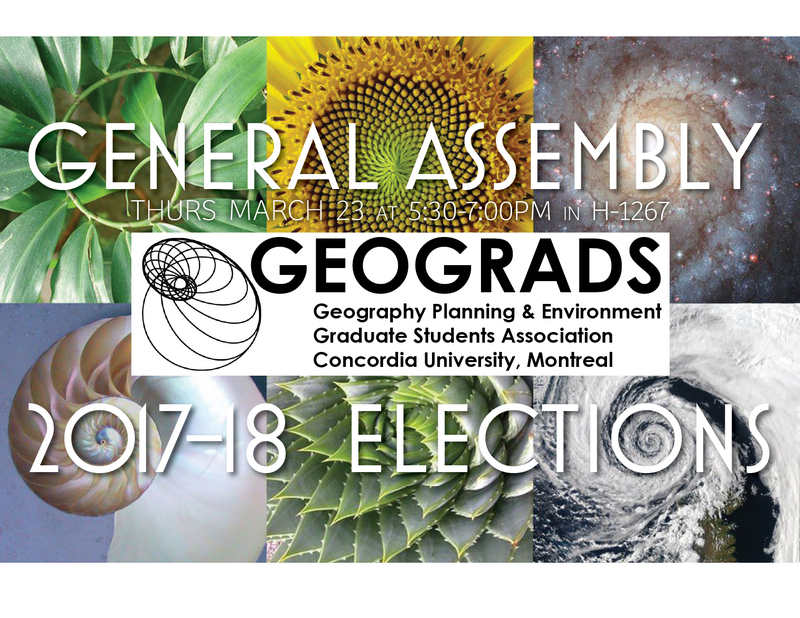 Nominations for Geograds Council will be presented at the General Assembly. Nomination period (7 days): March 16, 2017 – March 23, 2017. Uncontested positions will be acclaimed at the General Assembly on Thurs, March 23, 2017. If contested, a campaign period of 3-business-days will be followed by a ballot vote on Weds, March 29, 2017. Successful officers begin their positions on June 1st 2017. Collect at least three signatures from registered graduate students of the GPE department (MSc, MEnv,DEA, PhD). Present completed nomination form to the General Assembly on March 23, 2017. Candidates must be registered in the MSc, MEnv, DEA or PhD program in the Department of Geography Planning and Environment, and be a student in Good Standing with the Office of the Dean. Act as President of the Board of Directors. Act as Chairperson at all regular Council meetings, and at GEOGRADS General Assemblies. Arrange for the annual General Assembly to be held the subsequent academic year, irrespective of their presence therein. Oversee the day-to-day management of the GEOGRADS, and ensure all other Council members are performing their duties as defined below. Direct the implementation of Council resolutions. Act as the liaison between the GEOGRADS and the GSA, the Faculty of Arts and Sciences, and all external organizations. Be the official spokesperson of the GEOGRADS. Publish an Annual GEOGRADS report summarizing the GEOGRADS achievements and activities during the term. Have authority to create committees and delegate unto them the powers and task that he/she chooses. Carry out any other duty the council deems associated with the role of the President. i. Act as Vice-President of the Board of Directors of the GEOGRADS corporation. ii. Assume responsibilities of President in the absence of the President. iii. Recording and distributing minutes at all regular Council meetings, and General Assemblies. iv. Be the GEOGRADS archivist and ensure the continuity of the Association’s institutional memory. v. Publishing a newsletter at least twice in each of fall and winter semesters. vii. Carrying out any other duty the council deems associated to the communication function. Act as Treasurer of the GEOGRADS corporation. Chairing the Budget Committee meetings. The custody of all records, ledgers, receipts, or documents belonging to, or dealing with the financial affairs of the GEOGRADS. The GEOGRADS accounting process and of all receipts and disbursements. The administration of funds according to the GEOGRADS and for the preparation of all financial statements. Carrying out any other task the Council deems associated with the Association’s finances. Organizing guest lectures and other extra-curricular events. Carrying out any other duty the Council deems pertinent to the V.P. Social and Events portfolio. 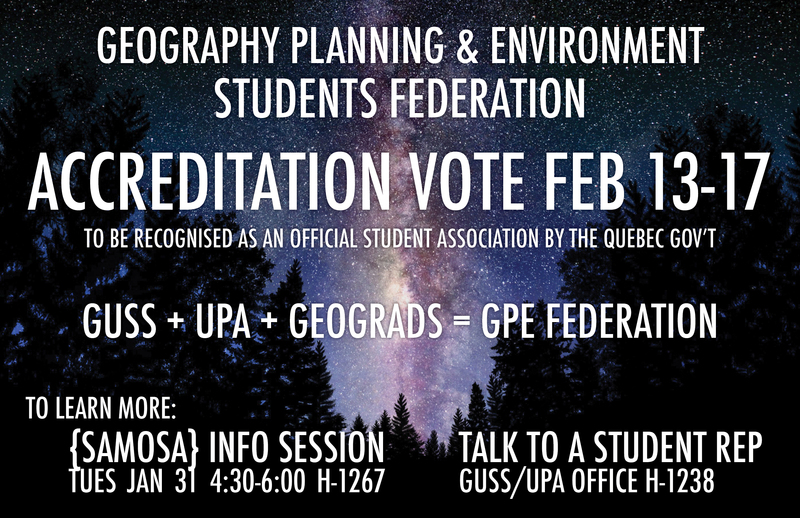 Serving as the GEOGRADS liaison with the faculty, staff, and undergraduate student associations within the Department of Geography, Planning and Environment. Coordinating Geography, Planning and Environment graduate student representation on the University’s academic and administrative organs, along with the President. Mark your calendars for the first General Assembly of the 2016-17 school year! The agenda for the General Assembly will be announced on or before September 13th. Feel free to submit items to the agenda, such as endorsements, to gpe.grads@gmail.com until September 12th. As always, delicious vegetarian and gluten-free foods will be served at this event! Print and complete the nomination form (download here) or take a copy from the Oasis. Nomination period: Sept 2, 2016 – Sept 15, 2016. Uncontested positions will be acclaimed at the General Assembly on Weds, Sept 15, 2016 unless a ballot vote is requested. Contested positions will enter into a campaign period (3-business-days) followed by a ballot vote on Wednesday, Sept 21, 2016. Elected officers begin their positions until May 31 1st 2017. Thanks to everyone who attended the G-O (Geograds Orientation) 2016! Here are the slides from the presentation complete with links and addresses to the different resources we suggested. The file is a pdf version of the ppt with notes.